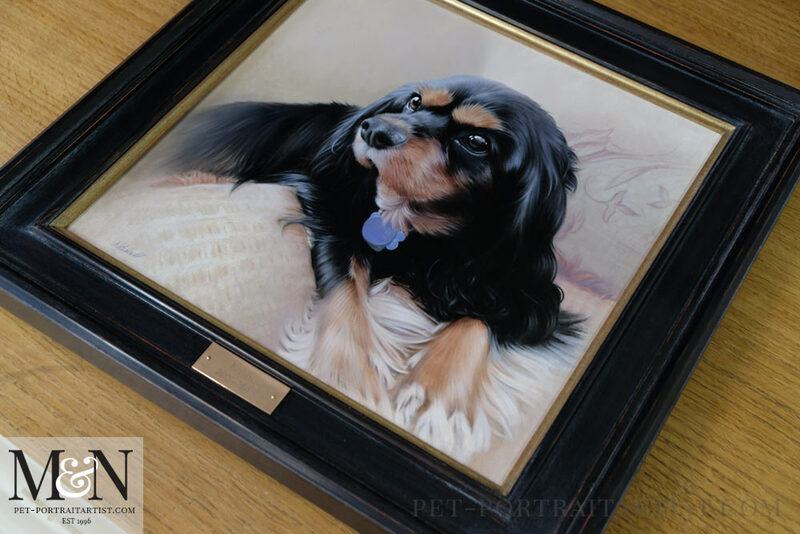 Welcome to Nicholas’ latest King Charles Spaniel pet portrait. Readers may have noticed that we haven’t posted any of Nicholas’ oil paintings recently. I will be adding them to our blog over the next few days as surprises have been given and frames have arrived! This is the beautiful portrait of Boone that Nicholas painted in October. 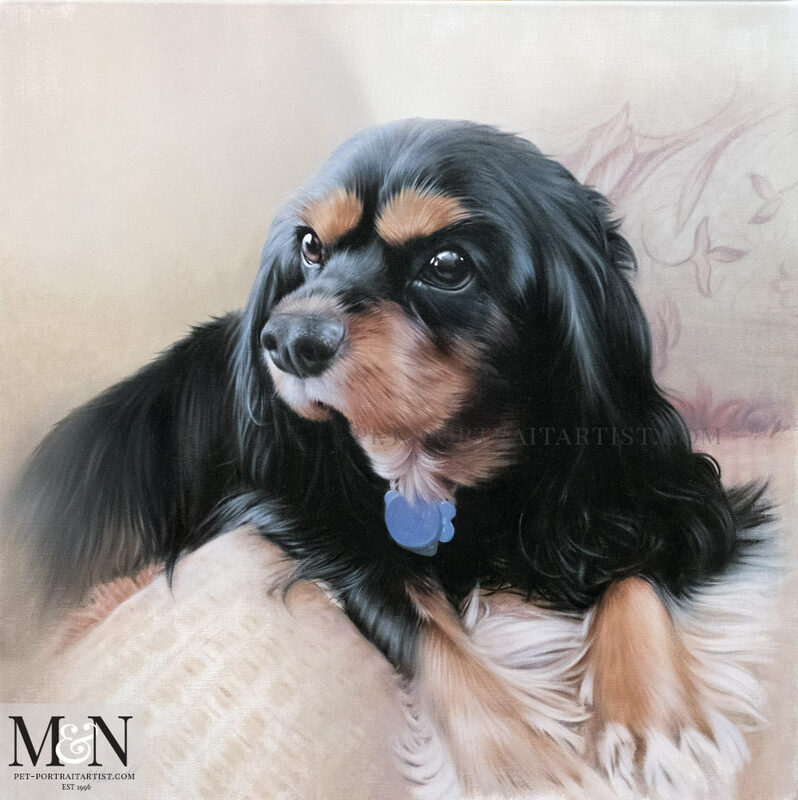 Cindy and her family in the USA commissioned Nicholas to paint Boone for them. However sadly Boone passed away at 12 years old and they all miss him dearly. Cindy felt an oil painting would be the perfect way to remember him by. Nicholas loved the photos of Boone as they were perfect to create a painting from. Above all, Boone had such stunning eyes, beautiful colours plus it was a gorgeous pose too. 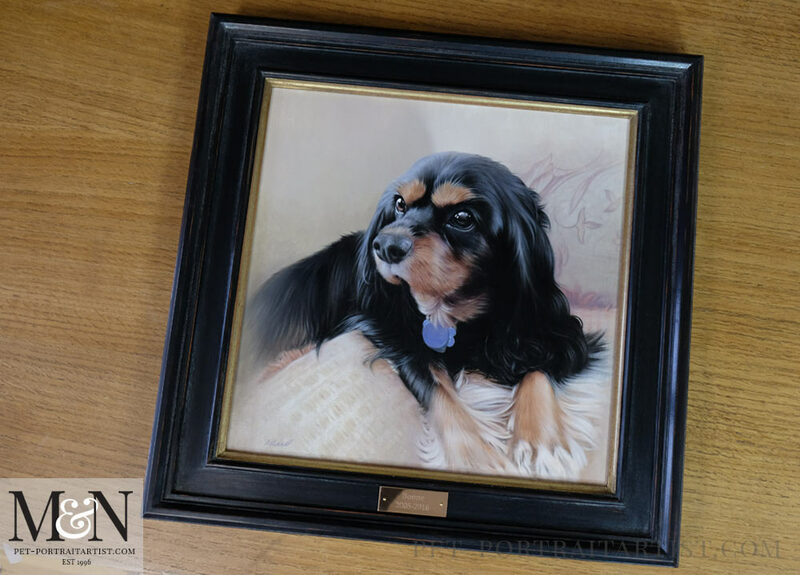 The oil portrait was traditionally hand painted by Nicholas at 16 x 16 inches in size. Cindy sent us the most wonderful email which you can read below. The family were absolutely thrilled with the painting and we were delighted. I wanted to share this picture of Boone’s portrait in our home. It is beautiful and the frame was the perfect choice. 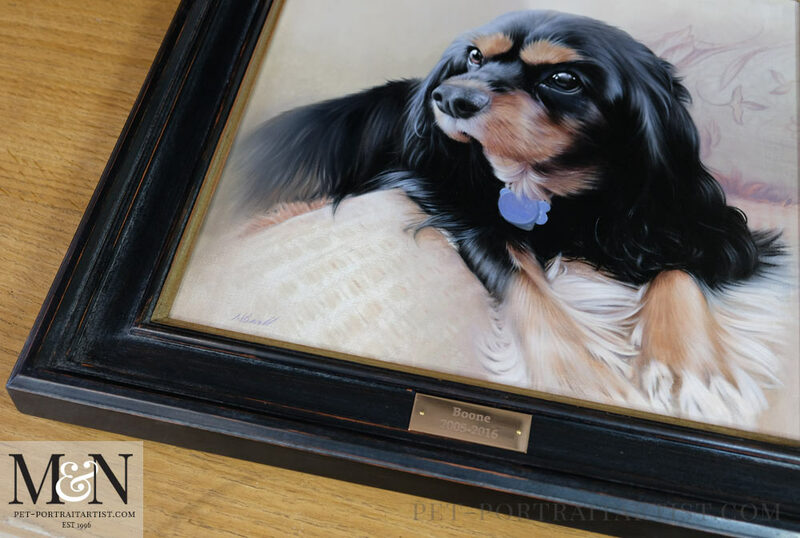 I am overwhelmed by the detail and the lifelike quality of your work. You truly captured Boone’s personality, especially in his eyes which are so realistic that I feel he could jump right out of the painting. There is no doubt, that is our precious Boone. The wall where we hung his portrait now looks complete as if it was waiting for him to come home all along. Melanie, when I began this journey with you many months ago I was still mourning Boone’s passing and from our very early communications I felt your compassion and kindness and that gave me the confidence and trust to begin this process. I know I will feel a connection with you forever. In addition, Nicholas, your work is exquisite. I am in awe of how you conveyed his personality as if you had known him all along. Your talent brought us so much joy! I can’t thank you enough for the happiness this portrait has given me and my family. We all feel that Boone is finally home and we couldn’t be more pleased. 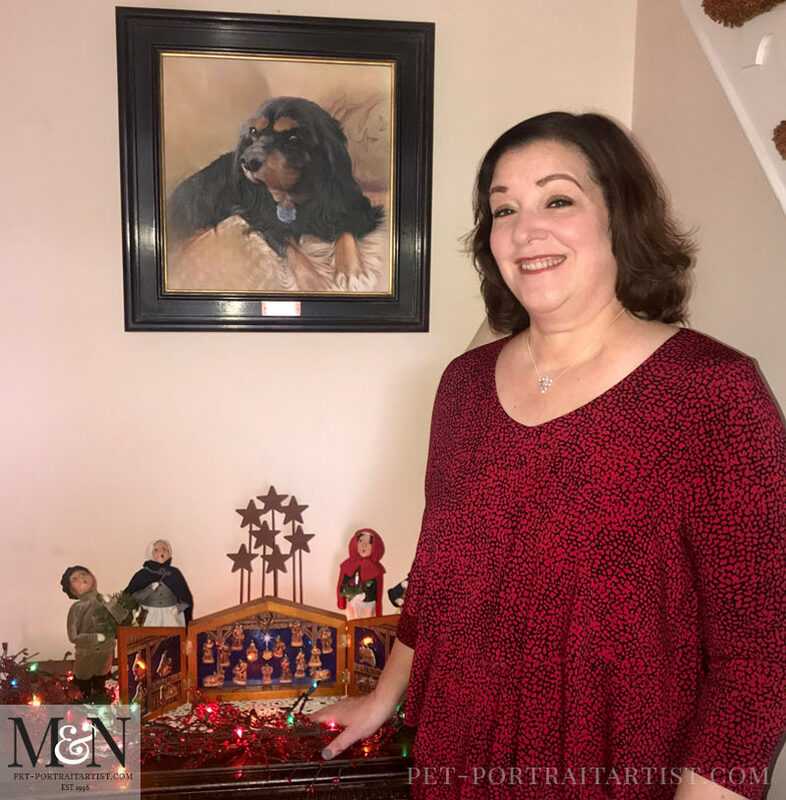 Cindy asked us if we would be able to have an engraved plaque made for her to complete her portrait. 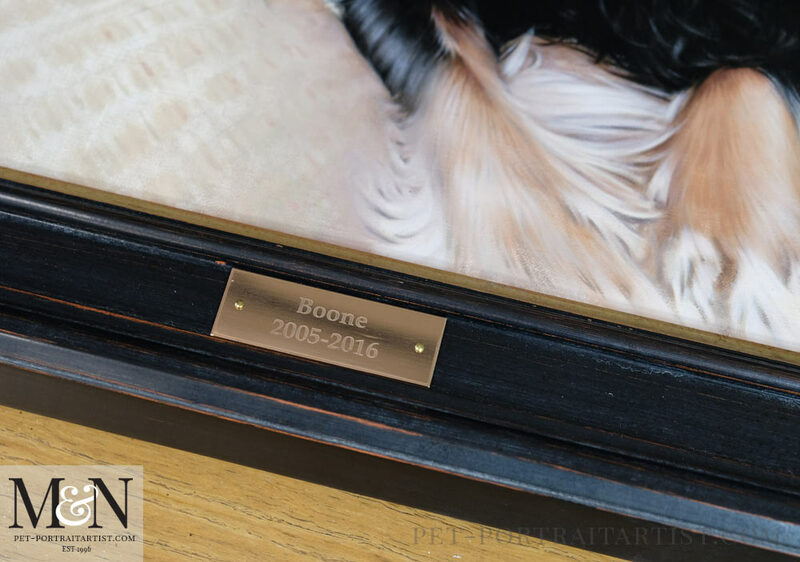 We have been working with a new engraver this year and the plaques are just simply amazing! For Instance, Cindy chose to have a mirrored Bronze plaque which worked beautifully with the colours in the painting. Scroll down to see more photos of the frame as it is just incredible! My family and I couldn’t be more pleased with Boone’s portrait. You truly captured his personality and the warmth from his eyes and the essence of the Boone that we knew and loved for 12 years. We will cherish this forever. Nicholas, I am in awe of your talent and so grateful that you share it with the world in this way. You bring happiness to so many. This has to be one of our favourite frames our framers produce. We have been working with a new framers this year. Similarly, every single frame they have made for us is simply exquisite. A lot of work goes into them and they are so sleek and smooth to the touch. They are simply beautiful. 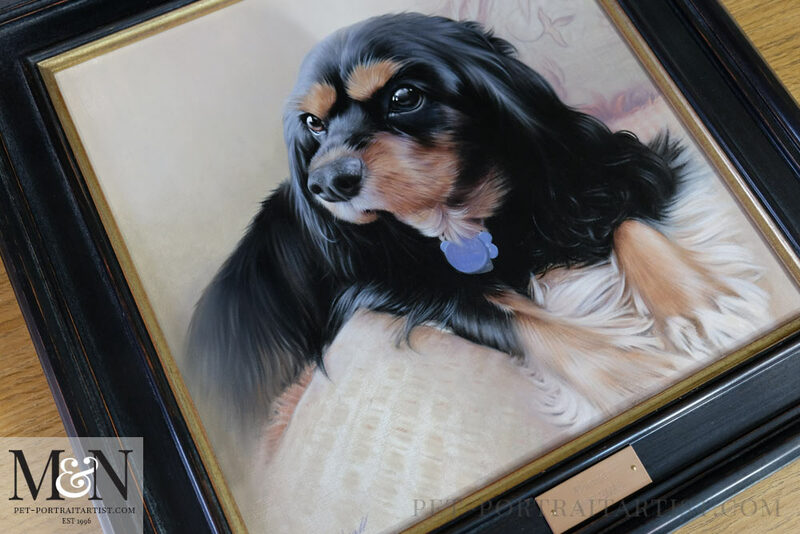 Also the frame that Cindy chose is our Hampstead frame and it was the perfect choice for Boone’s painting. It really brings Boone’s black fur out well plus the inner gold line enhances the warm tones in the portrait as well. It was simply the best choice of frame! 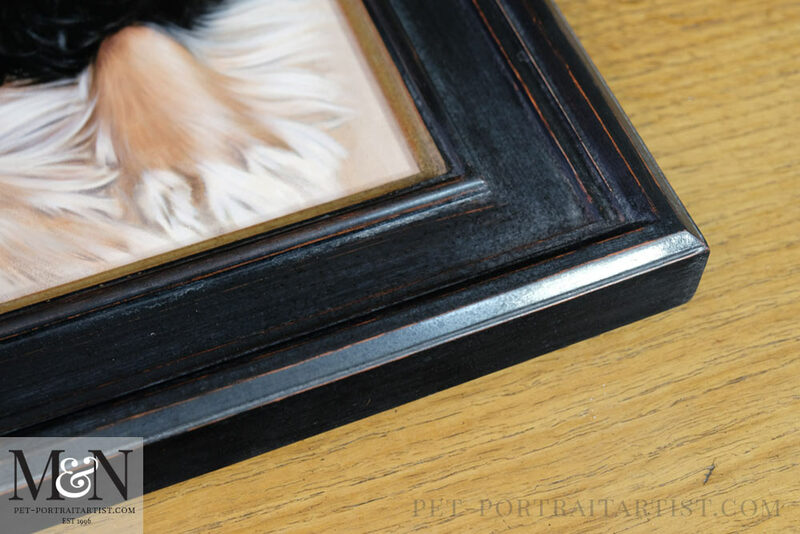 If you scroll down to view more photos of the frame close up, you can see the amount of work that has gone into the frame. 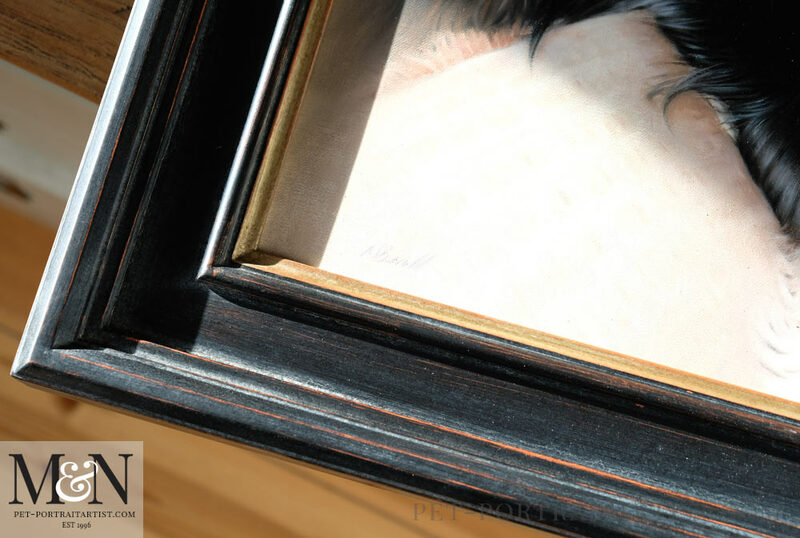 Our framers go through a number of processes to create the finished piece, its also not just one layer. Therefore much time was taken to create the frame as i’m sure you can see. Above all else, we cant wait to work with our framers in 2019. I also know that we are going to create some amazing framed portraits together.